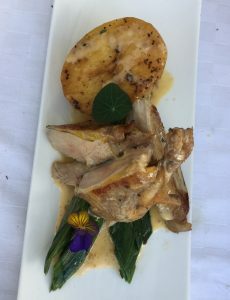 A delicious recipe for pheasant breasts, a dish demonstrated on our Game Day. 1.Ask our butchers to prepare the breasts of pheasant, place in a vacuum sealable pouch with the 300ml of cider, and vacuum until tight. 2. Cook the pouch in a sous vide water bath at 65°C for 1 hour. (Or if you don’t have the machine, poach on the lowest possible heat, gently on the stove or in a very low oven). 5. Heat rapeseed oil to 210°C, add drained potatoes, and fry, or roast in a tin in a hot oven, until golden and crisp. 7. When ready, open the pack of pheasant, reserving the juices.